Last week we took our family’s first big family adventure. With four kids ages 2-8 and a long drive ahead, the temptation would be high to buy each of them a tablet and get set for a quiet ride. 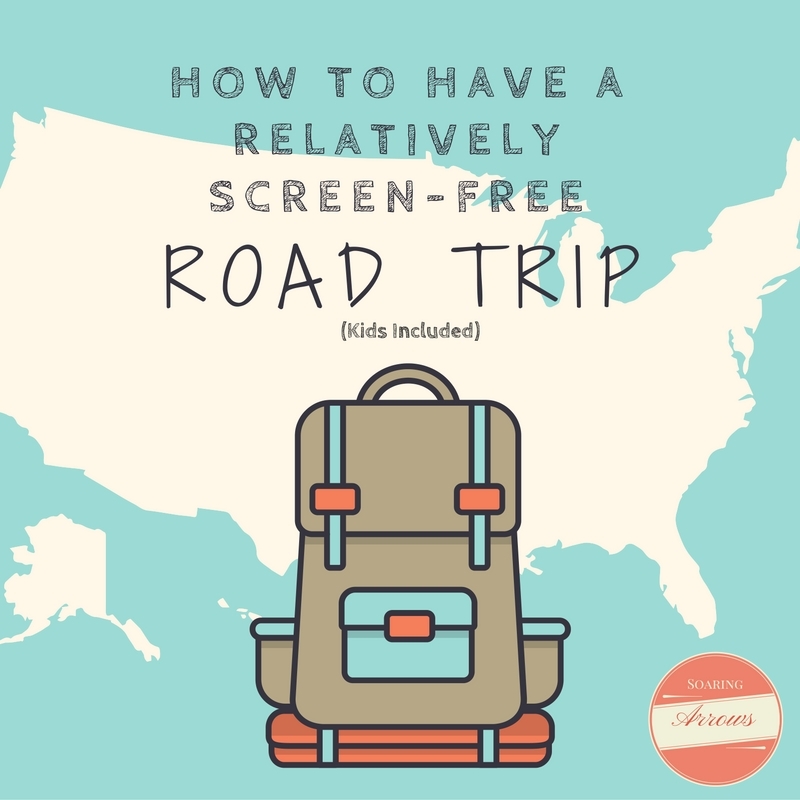 Here are a few reasons we stay as screen free as we can, especially on a Road Trip! This theory of mine was proven when we arrived in Tennessee and my Husband had decided to let our kids use one of his old devices to take pictures. Our littles are normally so low tech that the excitement level was huge. Within about 10 minutes they were arguing. Settled that and smoothed things over. Again. And again. And again. You can see where I am going with this. Within a few days this Mama Bear was done with the littles having technology on our adventure. After that things were a lot more pleasant and the siblings remembered they liked each other after all! I am OK with my littles being bored on occasion. Worlds of creativity and imagination are unlocked when they are left with their own thoughts. They spent a lot of our road trip time sketching with colored pencils and were completely content to do so! That being said I’m not going to drive in the car for 10 hours without giving them anything to do, those would be some pretty high expectations especially for a toddler! In fact those would be high expectations for me. I also wanted this to time for us to connect with each other without each sitting there with a tablet in hand. We do the whole DVD player, we aren’t completely mean parents! Only after we’ve been in the van for a few hours and it is also something they enjoy together. So everyone is laughing and talking about the movie instead of each kid being plugged in to and staring at their own little devices. Now I’m not casting any judgement! This is what works for our family especially with a Toddler, he gets super bored watching movies anyway so I knew that just turning things on wasn’t going to occupy Little Brave one bit. We had a limited amount of space for packing so I knew I had to fit the most useful stuff I could think of! So how did I keep four young kiddos entertained, relatively screen free, for all these hours driving? We had these for school anyway so I thought why not throw them in? It was perfect because each kid had their own board and some markers, they passed the eraser around and kept drawing and drawing! No paper trail to clean up. 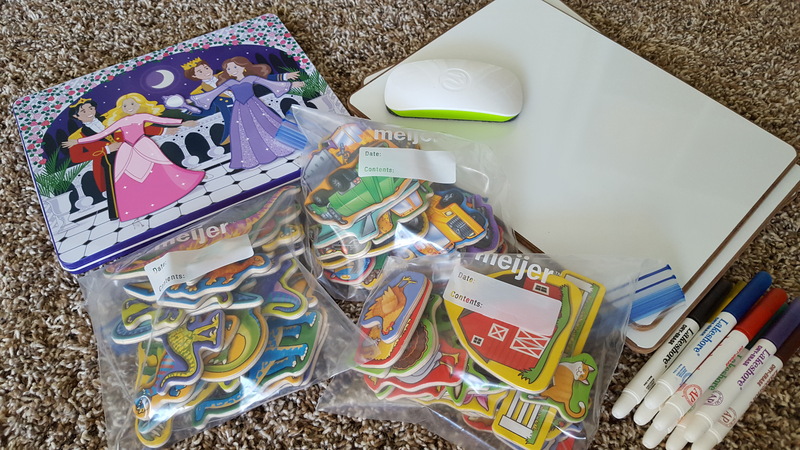 I had some vehicle, dinosaur & farm magnets for Little Brave and princess magnets for Wild Little Girl. That kept their little hands busy! My kids love art so this was an obvious category of stuff to add to our bin. I did stick primarily with Doodle Pads instead of a lot of separate pieces of paper to try to keep the paper trail from getting out of control. Each kid had their own Doodle Pad and I threw in a bit of loose paper for back up which we only used a small amount of towards the end of our trip. By the time we got home and had the whole van to clean out, we were very thankful to have kept the pieces of art to a contained pad of paper. We used the Crayola duel colored pencils that have a different color on each side, which was perfect for the limited space we had! 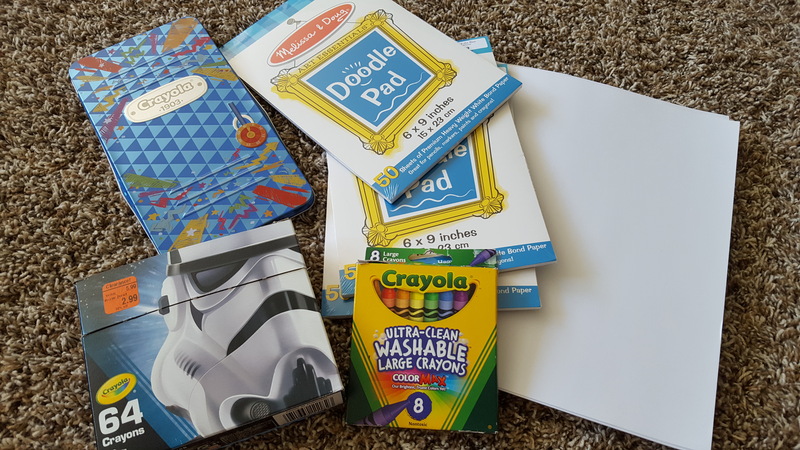 I threw in some Star Wars Crayons and Washable Large Crayons for Little Brave as well! I packed Where’s Waldo knowing that single book would occupy a lot of time! 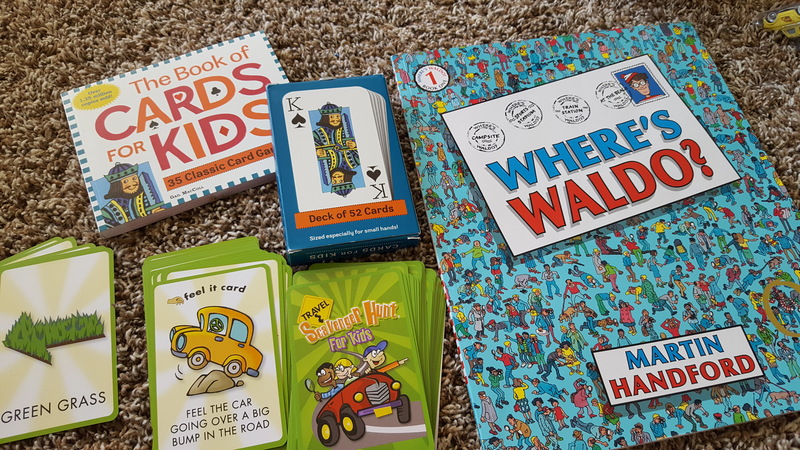 When we got to the last hour on our way to Tennessee we pulled out Travel Scavenger Hunt Cards and the kids thoroughly enjoyed trying to find as many items on their cards as they could. This game was a lot more creative than I expected! Many of the cards had some things you wouldn’t expect to find for a while, like someone sleeping in the car or a bump in the road. We loved this one! We never even got to The Book of Cards for Kids, but we will eventually! The kids were too occupied with everything else they had to keep them busy. The sure winner of the entire trip was the USA License Plate Game. Our two oldest littles were sitting in the backseat of the van with the board between them and were absolutely giddy with excitement when they found a new plate. 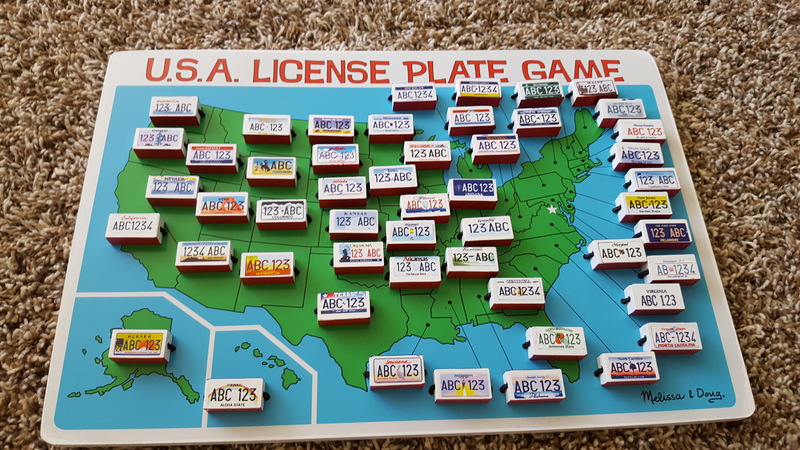 As we walked through parking lots at our destinations they would keep track of each new license plate they found and flip them over when they got back to the van. Not only did they play this game the whole time we were on our adventure, but they learned a ton about all the names of the States in the process. Because we are studying American History this year, this made my Homeschool Mama Heart incredibly happy. We traveled through 5 states and by the time we got home they had found 35 of the 50 states! 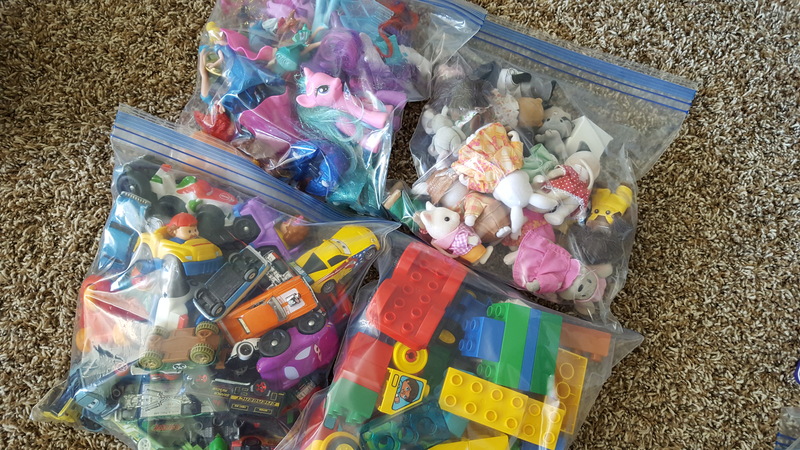 I filled 2 gallon size zip lock bags for the 2 smallest kiddos. For Wild Little Girl I filled one with tiny Magic Clip princesses/My Little Ponies and the other with Calico Critters. Little Brave had one bag filled with Duplos and another bag filled with small cars to play with. Not only was this helpful in the van but it was helpful when we arrived at our cabin as well. The whole week they had those toys to play with at night when we were done with all of our hiking for the day. If I had forgotten to pack any toys at all, Little Brave would have been climbing the walls! All of this stuff looks like a lot and I found a plastic bin I was determined to stick to. If something didn’t fit I that bin it was staying at home! 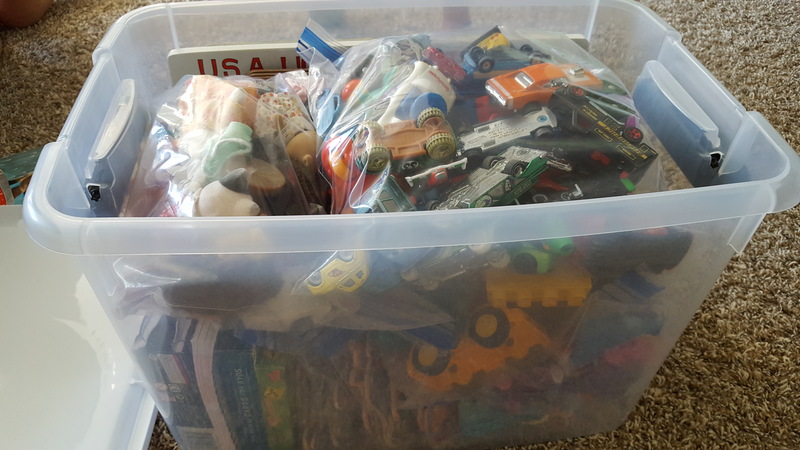 We had another small bag with books and DVD’s but I wanted everything else in this bin. It took some Tetris moves to make it work, but I did it! Here was the end result. As well as some very happy little travelers! Our trip went so well, we will probably keep traveling this way! Limited on screens and big on family connection. What tips do you have for screen free travel? Ana I am so glad! I am praying for you and all the changes you have ahead!